"Treasure island" by Nitro from MWC2006. Our story begins in a south part of England in the mid 1600s where our character Jim Hawkins (Elfoid) lived and worked together with his mother and father, Ruin and Will, in the 'The Admiral Benbow' inn. There were rarely any customers and so Ruin often molested his only child. That is why Elfroid, at the age of 16, was somewhat "different" from all other kids his age. It was a dark and rainy night with thunders tearing the sky apart when an old man set foot on the doorstep. He knocked several times. The knocking was rhythmical as if it was a M.O.R.S code signal translated into "d0$sman". Suddenly the door opened. Elfoid rushed to the door to take care of the stranger. The man was tall and strong and his face was dark and blurry. Elfoid blinked several times to make sure that what he saw was real. The man had no face. The stranger told Elfoid not to worry for he wore camouflage to hide his face and not a single man had ever lived to see his face. He told Elfoid to call him Captain or Raziel. And so the old veteran moved in and stayed along with the happy family. Elfoid tried to learn everything from the old man, as he appeared to be an old veteran. He tried to grasp in his mind all those that he could see, from the way he walked to the way he talked and pissed. He wrote everything down on his wikipedia diary. Elfoid was such a great student. Within months he evolved as a person and no longer had any desire of committing suicide. A long time passed before another man came to the inn. He asked for Raziel. At first sight, Raziel went white. He called him Black dawg. However, the man reminded Raz that his name had been changed to Bullet tooth tony. The two men had a long talk in the lobby. Elfoid could not listen as his father, Will, was molesting him and his mother (Ruin) demanded that he brought more of his school friends to the inn. A loud noise was heard. The family rushed in the room and found raz unconscious. Raz went ill for several weeks afterwards murmuring in his sleep that he had won BTT before. He told elfoid to look out for a one legged man. Elfoid looked for him but never saw him. Raziel died trembling in his sleep an hour later. Elf and Ruin rushed through the old man's clothes and underwear in the search for money before deciding to look in the most obvious place; the old man's chest. Elfoid managed to snag an envelope from the chest just before horses were heard. "Let's leave," yelled elfroid in a manly matter. They left just in time before the known BME pirate squad lead by Chohan turned the inn upside down. They did not find what they were after. Minutes later the Finnish army arrived lead by lieutenant Arzenic trained in the harsh conditions of neighboring Finland. BME squad ran off but abandoned Acheron as he left his last breath and joined the underworld (Halo2). Elf went to the town to see the wise man, Mr. Trelawney also known as Myrk. Myrk listened to the Elfoid's story very carefully constantly thinking how could creatures like Elfoid exist in the world. He opened the envelope only to discover that it was a treasure map drawn by limp in the 1400's and colored by Toecutter a decade later. Myrk had been dreaming of a treasure year after year for all of his life but had never managed to catch one even if his effort had peaked for at least the previous 8 years. Myrk together with Dr. Livesey (Grim) found the treasure idea intriguing. Grim constantly reminded Myrk that he cared too much but Myrk wanted the treasure so badly that he set off to gather a crew willing to go on this long and harsh journey. Grim eventually agreed to it by creating the necessary conditions for Myrk to prove himself, bringing in Wight Slayer as a technician to help. When Myrk returned from the harbor, he announced the fellowship that they were to sail the very next day. He told them that a very helpful man called Long John Silver otherwise known as Ramirez had found them a very trustful crew consisting of old veterans such as Henry, Fagline, Paris (LOL). Silver was a one legged man but made no difference to elfoid. The Elfroid was excited, as this was just the second time ever that he had been in a journey and together with his monkey Magical Trevor danced all night. They next day the fellowship gathered at the harbor. Their ship called the "Hispaniola" was in excellent condition. Myrk introduced the ships captain, Captain Smollett or Rabican. Rabican had a funny look, short and plump but the real funny part about Rabican was that he had to go to the toilet 20 times a day and stayed in the shower for a very long time each day. Elf was the one responsible of the showers and had a hard time cleaning them, suicide crossing his mind many times. The ship finally embarked on its long journey. Gradually Ramirez intentions were clearer. Elfoid remembered Raziel's warning about the one legged man after listening to a secret conversation among the Cox crew. Their plan was to kill everyone and get to the treasure. Two weeks later, they reached the island. Grim was pretty smart and knew all of the pirate stories, ships, battles, countries, dates, political systems, presidents, leaders, WW1-WW2 causes, hitlers mother/father, republican or democrat ideologies, Lordi albums, Lordi songs, fanta shokata/bombay actors etc. Therefore, cunning as he was he gathered the few men loyal to him and sent the rest of the crew on shore for a night out. Some of the pirates stayed on the ship while the rest lead by Ram set off for the island. Grim, Myrk and Elfroid went to the island too. Elfroid wandered alone on the island for a while and was surprised to see a hippy, Jesus like figure appearing out of nowhere. He introduced himself as Ben Gun but told Elf to call him Erik. Erik told Elfoid his story, how the pirate admins had deserted him on that island 3 years earlier. He agreed to help him. By the time Elf and Erik were back the ship was under pirates control and the few loyal men that had been left on the ship had been killed. Elf looked for Grim and Myrk on the island and found them near a small wooden house. Rabican was there with them too. They all carried guns and waited for the pirates. At midnight, the pirates launched a fierce attack. Ram was so stoned that he tripped on a stick and fall onto Paris. Paris started shooting all over the place killing and injuring all of his crew. The threat was eliminated. The fellowship moved silently in water and took over the ship as well. Erik took out all the rum bottles he had saved and celebrated with his new friends. The next morning they were to look for the treasure. Meanwhile, during the night a new threat landed on the island's shore. 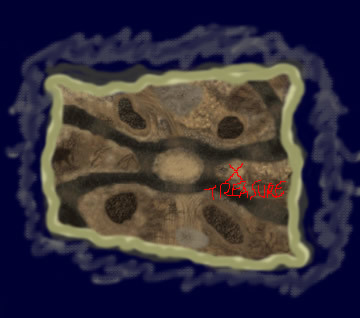 The famous BME squad led by Chohan had found the original treasure map, very similar to the one Limp drew but this one drawn by the famous bungie pirate 8 years before Limp. The fellowship realized they were in trouble. Erik told everyone not to be worried. He would challenge BTT to a retirement match where the defeated champion would be left on the island and his supporters would simply disappear. Elf carried the message. BME, overconfident as always accepted the challenge. Erik and BTT fought a fierce battle in which Erik emerged as the winner. Chohan could not bear the thought of defeat. He re-challenged Erik. Erik told the rest of the fellowship to leave the island during the night together with the treasure as if he knew that his end was near. He did look like Jesus after all. The fellowship left Erik alone on the island to fight alone the muslim infidels. Myrk after seeing the treasure got drunk with excitement 50 days straight. Upon landing on England, the elf took the treasure to a safe place. The fellowship wanted to arrange a time to gather where the treasure was to be split into equal shares among them. A time was never set and Elfoid finally suicided upon listening to Myrks hateful comments. -Today, the treasure is nowhere to be found and Grim still reminds Myrk that he cares too much.